From Zero to Certified in 45 Minutes. You don't have to write us a novel. Just create an account, fill in some basic information, choose your course, hit the "Finish" button, and you're set! 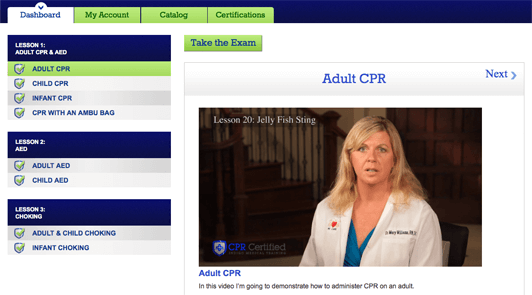 Like everything here at CPR Certified, registration is fast and convenient. Video Lessons that Don't Waste Your Time. We offer short, easy-to-watch video modules for each lesson-and you can pause, rewind, replay, and skip over information you already know. Plus, our video lessons are the highest quality on the market, with detailed step-by-step training from a registered nurse. Skills Test? Not Unless You Want One. 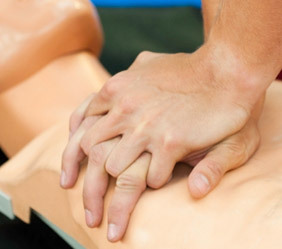 Whether you’re earning your first CPR certification or getting recertified, the process doesn’t have to be time-consuming. With us, you can finish your training, take the exam, and earn your card—without an in-person skills test. Although if you’d like to schedule an in-person test, we can connect you with a licensed instructor in your area. Just contact us. Take the Exam When You’re Ready. You can take your certification or recert test at any time once you’ve ordered your course—no waiting. All tests are multiple-choice, and you’ll find out immediately whether you passed. If you didn’t, you can take the test again as many times as you need to. You’ll never have to pay more to retake a test. 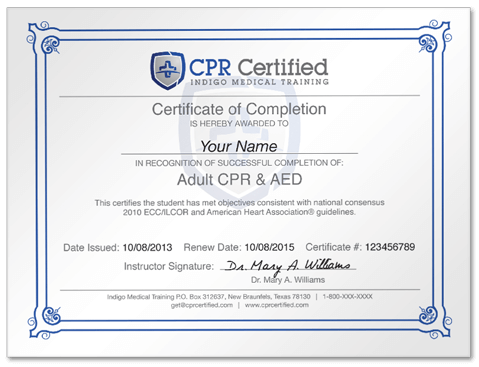 Get Your Certificate Immediately - and Your Card Shipped Free. You won’t have to wait to get something you can show your employer. Immediately after you pass your test, we’ll send you a printable certificate. Your wallet card will be shipped free of charge; in most areas of the United States, it will arrive within 5 to 10 days. Rush and international shipping are also available. The Highest Quality Card You Can Get. Speaking of cards, ours are the best quality on the market. They’re solidly reinforced, made of high-quality vinyl, double-sided, and waterproof. They look professional because they are—more employers and health care organizations accept our card than any other nationwide.